You should know the book "Guitarmaking - Tradition and Technology" for a complete understandig of how to make this joint. Though a planed surface gives the best condition for a glue joint you might want to use a router. Routing the surface smooth with a router saves time and produces excellent results, even if you are a beginner. 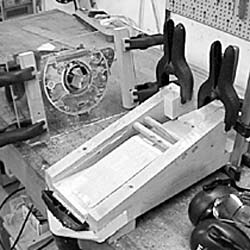 A jig will be needed, though, to allow guiding the router over the surface at the desired head angle. Screw two pieces of wood with perfectly identical slant (angle identical with the head angle, i.e. in our case 15 degrees) to a baseboard that has to be wider than the neck blank. Arrange the peghead part and the neck blank as described above. You won't need any adhesive tape if you clamp the two parts with a small, flat wedge between the base and a horizontal wooden bar fastened about 5mm (3/16") above the two parts of the neck. A thin strip of wood placed on either side of the base ensures that there is enough distance from the sides of the jig. Fasten the router on a sufficiently large baseplate and set two edge guides so that the router can reach the whole area that needs to be routed but cannot rout into the jig. Mount a cutter bit as large in diameter as possible and do not take off more than 1mm on each pass. Orientation is made easier with a clear plastic base. Wearing eye protection and kneeling on the floor I sight the router as I smooth the surface. If the surface should not be perfectly smooth after the first pass, set the bit lower by another millimeter and continue to rout until the surface is smooth. Finally, all marks left by the router are removed with a scraper.